Culinary Tours Spain is offered by Sabor de Almeria, who is entering the world of culinary trips and excursions under the brand of Spain for Foodies. Whilst there is much written about food, in terms of recipes, copious numbers of cookbooks and magazines, together with a wide variety of cooking programmes, there is nothing better than experiencing the real thing in an area of the world of which you are unfamiliar, learning about and tasting food you’d not normally experience, all under the watchful guidance of a ‘foodie’ professional. Combining our considerable talents in the marketing and food arenas, ‘Spain for Foodies’ has created a range of gastronomic house-party experiences from one to three days in duration. Our Culinary Tours Spain for Foodies customised excursions can take a wide variety of forms be it tours to street food markets, a guided tour of an olive oil museum and olive oil factory, specialist delicatessens, food producers, citrus farms, Michelin star restaurants, Casera (traditional home cooking) Spanish restaurants, cooking schools, wine tasting and visiting or even a trip to a gastronomic monastery. Each and every customised excursion is tailored to exactly what the client-foodies wish to experience and see, and each excursion is hosted by a foodie professional involved in the food business, be it a chef or a food writer or such like. Naturally each customised excursion is priced according to the client’s budget and requirements. Prices are available upon application. Visitors to Almeria City don’t have to miss a thing when they hire Almeria’s only professional food photographer and specialist food writer, Steve Homer for an exclusive and personally hosted and guided tour of the best city bars, restaurants and tapas. 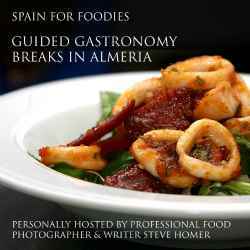 Having photographed at many of the venues and written about tapas for international magazines and his own food magazine ‘Comida de Almeria’ Steve has an understanding of Spanish culture, and traditions especially when it relates to Almeria food and Culinary Tours Spain. In Almeria City knowledge is everything…from ensuring you are sampling the best tapas and wine to ensuring that you know what has been ordered. Normally conducted in the heart of Almeria City where the buzz of tapas bars comes alive at lunch and/or in the evening these tapas tours introduce the clients to the real Spain that only a local would know and experience not normally found in reading a tapas guide. 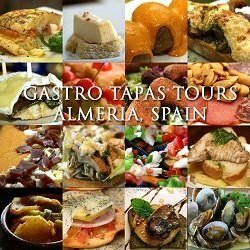 Conducted on foot these tapas tours allow you to visit only the very best, taste the best tapas and experience the best of Almeria City bars, wines and cooking. Our Daylight Gastro-tapas tours which include a trip to the food market and a re-knowned local delicatessen for shopping and a coffee break, start at 10.30 a.m. ending at approx 16.00-16.30 p.m. The tour visits 4 of the best tapas bars within the city, as well as a few other unscheduled stops. 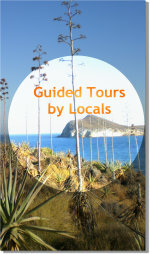 The cost for these tours, includes all food and, beers or the finest Almeria wines, and taxes. plus the personal attention of your host and guide in the guise of Steve Homer, for the best part of a 5 ½ hours tour of Almeria. Whilst this tour is classed as a Gastro-Tapas tour, guests will experience the best in traditional tapas at some of the finest traditional tapas bars as well as some rather unusual venues. Minimum tour party 2 people. This tour will be conducted on foot, so please ensure you have comfortable shoes. 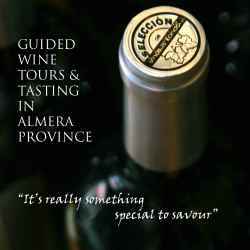 With 23 bodegas (wine cellars/vineyards) within Almeria Province there truly are some sights to behold. The Alpujarra region, just below the snow-capped Sierra Nevada mountains, is fast becoming a very popular destination with wine lovers as they get to discover the relatively unknown gems of Spain. Award winning wines from bodegas such as Cristina Calvache, or Seleccion de Vinos de Fondon, or Vino Laujar are rapidly becoming sought after in other parts of Spain, as the palettes of wine lovers sample something new. Our bodegas tours include a visit to each of four vineyards in the Alpujarra Region culminating in lunch at a local Alpajarra restaurant. 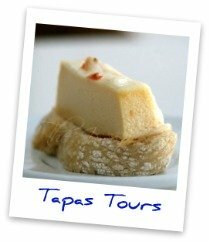 All in all an exceptional "Culinary Tour Spain"
All prices are inclusive of transportation, tastings and lunch with wine. We require you to confirm your reservation at least 48 hours before commencement of the excursion. 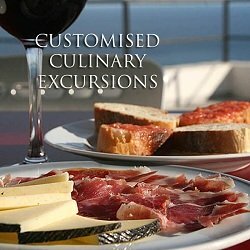 Two or three day gastronomic breaks and 'Culinary Tours Spain' are becoming incredibly popular throughout the entire year. Whilst longer breaks prove to be popular with the long distance tourist, these short culinary breaks and culinary tours Spain are proving to be really fashionable. 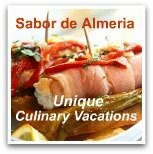 Available any time of the week, subject to other bookings, you may find yourself joining other like-minded foodies for a truly memorable gastronomy tour of Almeria City and other parts of the province. 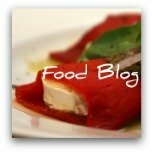 There is not set agenda for these culinary tours Spain as they are generally tailored to suit the visitors. 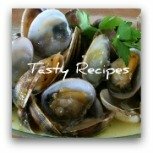 Naturally where there is a party already booked then you have the choice of joining that group or just doing your own tour with a different food guide. Whilst we do not have an arrangement with any one specific hotel for these Gastronomy breaks there are some very wonderful boutique hotels available with which we do work and with which we have organised preferable terms. We would be happy to liaise with the hotels on your behalf to ensure a smooth visit.